Find out how deep the rabbit hole goes! 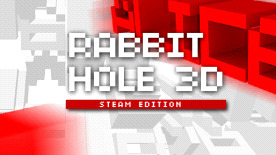 Rabbit Hole 3D: Steam Edition is a minimalistic retro puzzle game. Supports SteamPlay. Play it on Windows, Mac, and Linux! Steam Leaderboards and Achievements unlock! Compare your scores with your Steam friends! © 2014 Zero Rock Entertainment and JK Soft. Developed by JK Soft. Rabbit Hole 3D: Steam Edition is a registered trademark of JK Soft. All other trademarks are property of their respective owners. All rights reserved.